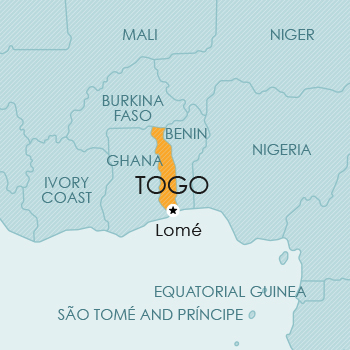 The Republic of Togo lies in West Africa with the Gulf of Guinea on its south side, Ghana to its west, Benin to its east, and Burkina Faso to the north. Trade mark protection is obtainable only in terms of the Bangui Agreement by way of a filing with the OAPI IP office. Patent protection is obtainable only in terms of the Bangui Agreement by way of a filing with the OAPI IP office. Design protection is obtainable only in terms of the Bangui Agreement by way of a filing with the OAPI IP office. Provision is made for copyright protection in OAPI member countries in terms of the Bangui Agreement. In Togo further legislation on the protection of copyright was enacted – Law no 91-12 of 1991 on Protection of Copyright, of Folklore and Neighbouring Rights. Provision is made for plant breeders’ rights to be obtained in terms of the Bangui Agreement by way of a filing with the OAPI office.